Gravestompers is a cute and enjoyable 3rd-person endless-horde style game. It’s been out for awhile for iOS, and is now available for Android devices. While additional purchases are not required, the game’s market entices you with items that may require in-app purchasing. GraveStompers: Zombie vs. Zombie has been out for the iOS for nearly 6 months, but was released this past January for the Kindle Fire. Unfortunately, I was not able to fully review this version of the game using only original-model Kindle Fire. (Admittedly, the issue was likely me having “rooted” my device awhile back to allow me to install and run a custom Android 4.2 operating system (aka Jelly Bean) rather than the version of Android currently powering the Kindle Fire. While the device runs well, and looks particularly awesome, the downside to rooting, is that some things just don’t work well.) I also played it on an Android smart phone, and two iOS devices. 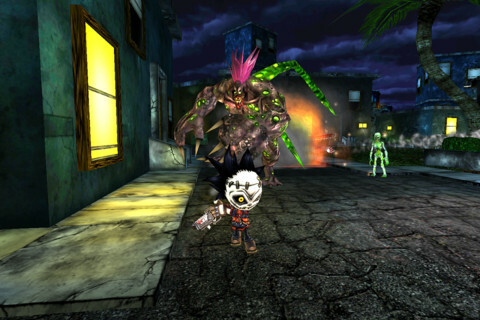 GraveStompers is like a mobile version of popular game modes, like Halo’s Firefight or Gears of War’s Horde modes, where players are tasked to defend themselves and eliminate waves of enemies. Each victory is followed by a greater challenge. Rinse and repeat! You assume the role of Max, a cute little zombie (by cartoon zombie standards), who has been asked to eliminate the undead infestation of Slumbering Cove. The game’s villain, Dr. Cayhille, has abused the power of science, and like the work of all brilliant madmen, it has resulted in the something horrible — the walking dead. Players have a multitude of weapons at their disposal, ranging from melee weapons, like pipes and chainsaws, to ranged weapons (aka guns). 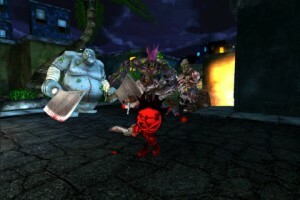 GraveStompers is a 3rd-person action game where you control Max’s movement by using a virtual directional pad on the left side of the screen, and control his view with virtual pad on the right. Tapping the screen on the right side will perform your weapon actions, and there is an auto-lock button allow to you to circle-strafe around the zombie hordes, filling them full of lead, without having to worry about steadying your aim. Like any game that takes up your screen with virtual buttons, if you have a device with a larger screen, you’ll benefit from the larger real estate. At the same time, you may not want to go too big. I played GraveStompers on four different devices: a Samsung Fascinate Android phone, the 1st-generation Kindle Fire, a 4th-gen iPod Touch, and a 3rd-gen iPad. Of all devices, I preferred the 7″ screen of the Kindle Fire best. Like Goldilocks, sometimes the sweetest spot in something right in the middle. As you rack up your zombie slayings, you’ll earn bones. Bones are one of the multitude of currency models offered in GraveStompers. The other is skulls. Skulls and bones can be used to customize and unlock items, like new melee weapons (sledge hammers and spike maces), firearms (shotguns, rocket launchers, and laser gatline guns), and characters skins. Each character has a unique damage modifier and hit points. The tougher/stronger the character, the more it’ll cost you. You can also use real money, at least on the iOS (I wasn’t able to confirm the details on Android) to buy skulls and bones in bulk. If you’re a bit confused, don’t worry — you’re not alone. 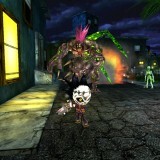 In addition to multiple currencies, some items/unlocks can only be purchased with cash, or bones, or skulls. Bones can be acquried with some old-fashioned hard work and elbow grease. Skulls, on the other hand, can be earned by paying cash or by clicking on advertiser’s applications and links. If you’re a fan of the movie scream, you can unlock Ghostface (the masked villain) for $4.99. It’s obvious that GraveStompers was designed to encourage you to spend money via in-app purchases to get the good stuff. Thankfully, you aren’t required to pay anything if you don’t want to, but the path getting their may be tougher and take longer. As noted on in the product description on the Amazon App Store for Android, GraveStompers is “intended for high-performance mobile devices only… Single Core Processor devices will NOT support this game…” I tried it out on a variety of mobile devices, including my phone, the aging Samsung Fascinate, which allowed me to play the game, but had exhorbantly long load times. You’ll definitely want a more current device if you’re going to play GraveStompers.